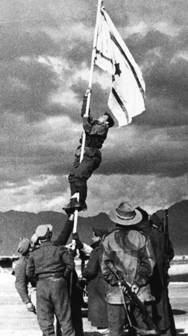 Operation Uvda (5-10 March, 1949) was a military operation of the IDF in the 1948-49 Israel War of Independence to claim Eilat (Um-RashRash) for Israel. It took place in March of 1949. After it became evident that Jordan intended to claim Um-Rashrash as Jordanian territory, it was decided to occupy Eilat quickly and in a way that did not involve engagement with Jordanian troops that had been occupying it. Units of the Golani and Negev Brigades were ordered to advance to Eilat. 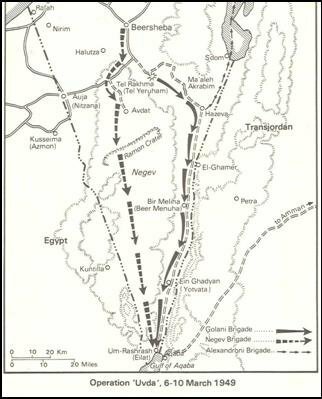 Golani advanced through the Western Negev, whereas the Negev (7th) brigade advanced through the center. 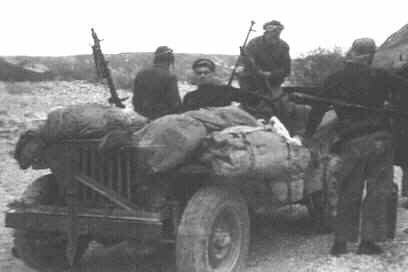 Photo shows a 7th (Negev) Battalion Negev Beasts commando jeep on the way to Eilat. Negev Brigade reached Eilat first, bringing in part of their forces through Egyptian territory at Taba in a surprising and somewhat risky maneuver. The commander, Nachum Sarig, took the Negev Beasts Jeep commando through Moon Valley ("Biqat Hayareah"). According to one version, he surprised the Egyptian sergeant in Taba. According to another version, permission was requested from the Egyptians for a one time border passage. To expedite the transport of troops and equipment, IDF made extensive use of an airport at Sde Avraham. A detailed account of the conquest of Eilat and the passage through Taba is given here: Operation Uvda - Liberation of Eilat. 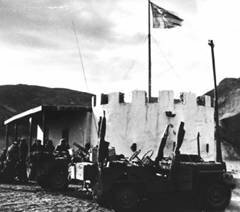 The Negev Brigade reached Eilat first and Avhraham Eden ("Bren") raised on improvised ink flag drawn on a sheet in front of the police station at Um Rash-Rash. There are various accounts of who drew the flag, but apparently it was the Brigade Secretary Puah Arel. Eilat had three mud buildings and a beautiful beach, as shown in the photo below. References: Teperson, David, "Eyes of the Beholder," 2008. See Negev Beasts. All photos from the book. Additional references from Wikipedia Hebrew.